I have recently become aware of social media discussions supporting misleading interpretations of the 2016 study “Carrying capacity of U.S. agricultural land: Ten diet scenarios” by Peters, et al., which was published in the journal Elementa: Science of the Anthropocene. 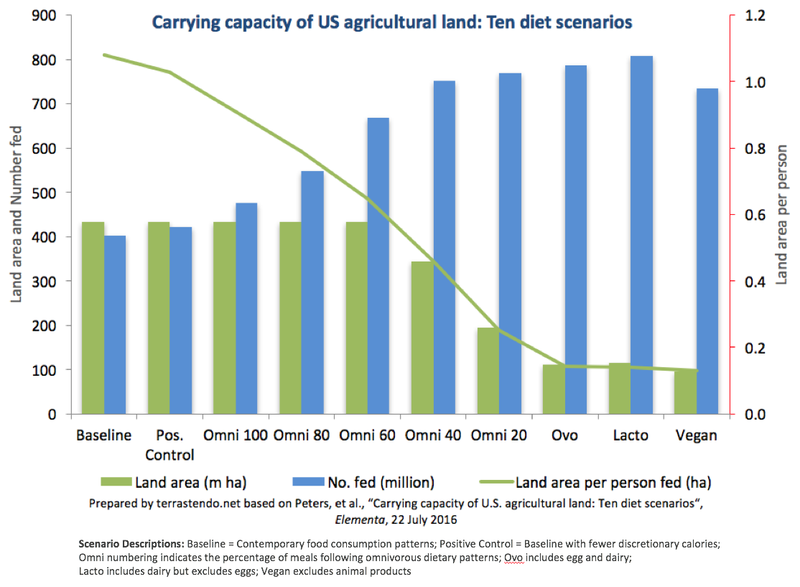 As I reported in my article, “Livestock chief gets it wrong on the vegan diet“, the purpose of the study was to compare, firstly, per capita land requirements and secondly, potential carrying capacity as measured by the number of people fed. The study found that the vegan diet (which excludes all animal products) was the most efficient of the ten diet scenarios studied, in that it required the least amount of land per person fed. It was also extremely effective in terms of the overall number fed. An article from August 2016 on the Quartz website focused on the fact that four of the ten diet scenarios could feed more people than the vegan diet. But at what cost in terms of human health, planetary health, biodiversity loss and impacts on food production animals themselves? The author of the Quartz article, Chase Purdy, lost his way when he used the finding regarding carrying capacity to question the sustainability of the vegan diet scenario. In any event, why isn’t the reported ability of the vegan diet scenario to feed 2.4 times the 2010 US population considered adequate? How many more people do we want in the US? Even the best performing scenario on that score was only marginally ahead of the vegan diet, at 2.6 times the population. To their credit, the authors of the original study raised the possibility of the US sharing excess food production with other nations, noting that future work would be required to determine the best way of doing so. Their findings indicate that the three diets that excluded meat were between 7.5 and 8.3 times more efficient (in terms of land area per person fed), and between 1.8 and 2 times more effective (in terms of number of persons fed), than the contemporary US diet. They were at least 77% more efficient than the best-performing diet containing meat. My “livestock chief gets it wrong” article referred to an article by the director general of the International Livestock Research Institute, Dr Jimmy Smith in The Guardian. Although the authors of the Elementa study reported that the vegan diet required the least amount of land (per person fed and in absolute terms) out of ten alternative dietary scenarios, Smith erroneously claimed that the researchers had found that the it fell behind certain other diets (including some containing meat) on that measure. It seems The Guardian needs to vet material from guest contributors more closely, as Smith’s effort was very poor. The Elementa study once again highlighted the ability of the vegan diet scenario to efficiently supply our dietary needs. It is time for more people to review the available evidence objectively, as our ability to overcome climate change and other existential threats may depend on it. Minor additional comments added on 21st September 2017, and the third and fourth last paragraphs added on 22nd September 2017, along with a sentence concerning the overall number of people fed.